Hey Lovelies! Do you love hydrangeas as much as we do?! If so, you are going to LOVE this guest post from Whole Blossoms on why they are the perfect flower for weddings. Especially wedding bouquets. 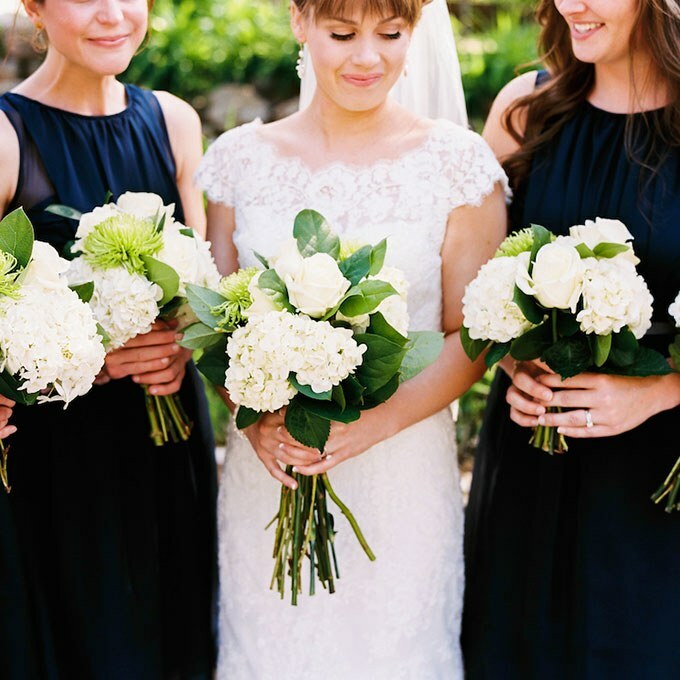 Hydrangea wedding bouquets are so lovely! Hydrangeas come in all different colors to match any wedding theme and are soft and romantic to highlight your feels for your big day. Here are some great ideas and reasons why hydrangeas should definitely be considered on your big day for your bouquet! Hydrangeas are pure bliss when it comes to wedding decorations and flower arrangements. Think of volume they have, the colors, the versatility and filling spaces; hydrangeas pass all the tests with flying colors. They complement the color and size of the bouquet. They are available throughout the year to help couples make gorgeous flower arrangements for your reception and ceremonies. When you actually contemplate what they bring to the table, it is no wonder wholesale hydrangea flowers are such a popular trend in wedding décor circles all over the world. The flowers are loved by brides all over the world due to the availability of a wide spectrum of colors and their ability to fill spaces easily. And this means whether you want to add the perfect pop of color to your bouquet, or maybe add more depth and dimension to the whole arrangement, or even do both, hydrangea are perfect! You could use them to make beautiful wedding centerpieces, bridesmaids bouquets, bridal bouquets with them or use them in boutonniere arrangements, corsages, ceremony arches, ceremony décor, altar décor, wedding cakes décor and various other wedding details at every possible level. The big heads and bulky blowsy petals make them a revelation in all sorts of wedding flower arrangements and especially wedding bouquets. They blend perfectly for any theme, venue, style, décor, color palette, or even season. They also have such large and bulky blossoms, which essentially means that you’re going to need only a few stems when it comes to filling your bouquets or centerpieces to make a perfect statement. Hydrangea are mostly budget friendly too. Only getting a little pricer when not in season. Since they are mostly grown throughout the year, they are typically nice on the picket books! 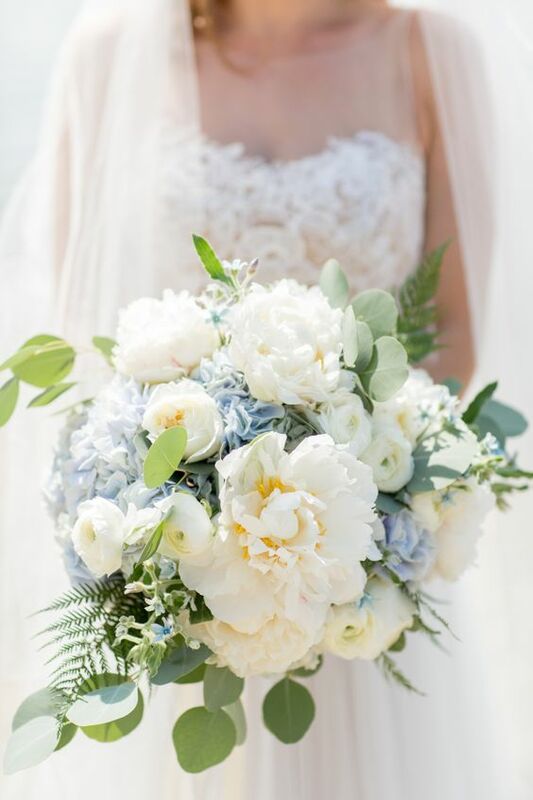 We have put together some great inspiration for fresh hydrangea bouquet ideas that will definitely give you some ideas for your wedding! 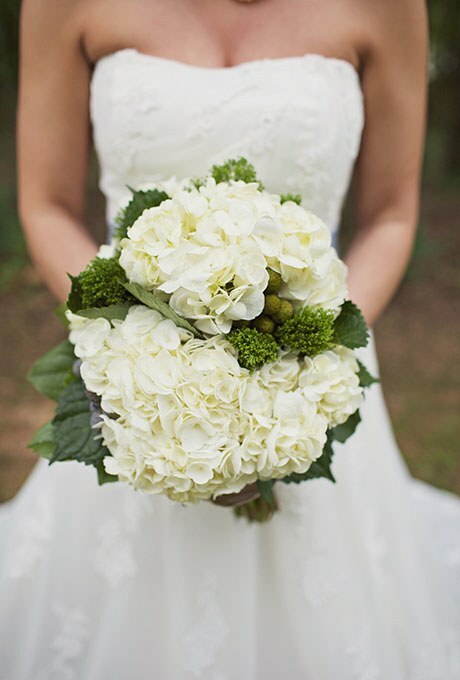 If you’re planning a classic wedding theme, the pale green and white hydrangeas with a little bit of bright foliage could be the ultimate combination for a wedding bouquet. The arrangement is chic, sophisticated and does not look over the top while at the same time is perfect to draw the eyeballs when you go on the big stage for making a statement. For a garden-inspired theme, you could always consider a pairing of lush hydrangeas and other blossoms like; peonies, roses, and Queen Anne’s lace. The present arrangement is perfect to throw a little sunshine on your wedding ceremony and be the center of attraction. 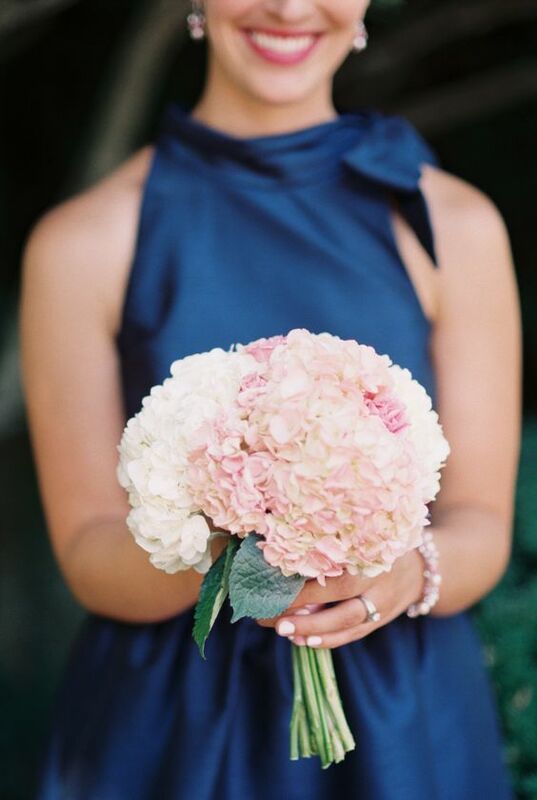 Hydrangeas could be used either as a pop of color or maybe to add textures and volume to the whole bridal bouquet arrangement for your special day. Hydrangeas work beautifully with all sorts of arrangements and wedding themes. 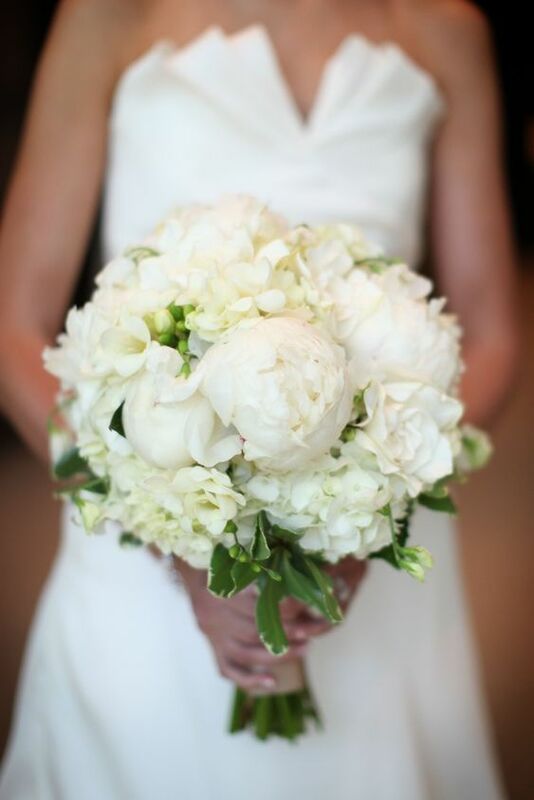 If you’re contemplating a wedding bouquet arrangement for a formal ballroom wedding, you’d definitely do great if you could throw some peonies, roses and dusty millers in the mix. You could even add some greenery options in the arrangement to make it look even more lush and majestic for the wedding ceremony. Hydrangeas could be easily used to add romantic textures and beautiful colors to a wedding bouquet and that too if you’re especially looking for a romantic bouquet arrangement; nothing could beat them to it. For instance, you could easily combine some fresh white hydrangeas, blush roses and a lot of greenery to make an elaborate yet beautifully romantic wedding bouquet for the ceremony. There are so many pinks that hydrangea come in. 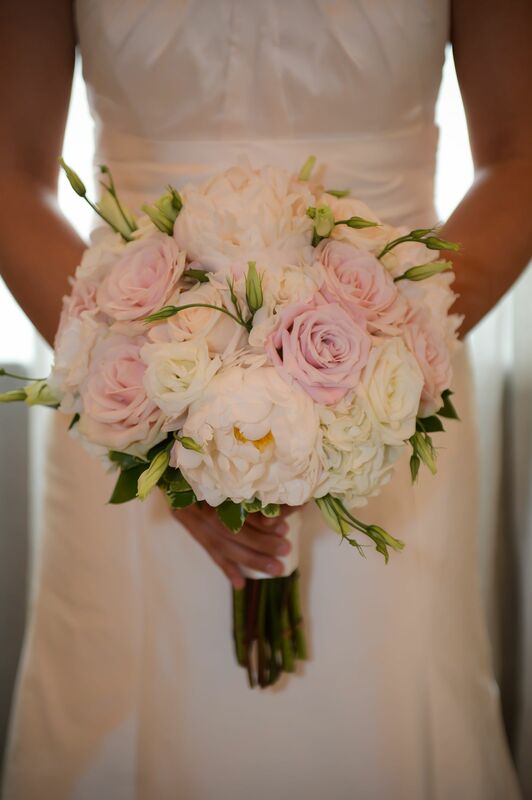 From dark pink to light hydrangea have just the shade you need for your perfect bouquet. This makes them a great option if your going for a pink theme for your wedding. Pink hydrangeas symbolize heartfelt emotion which makes them the perfect flower for your wedding and your wedding bouquet! 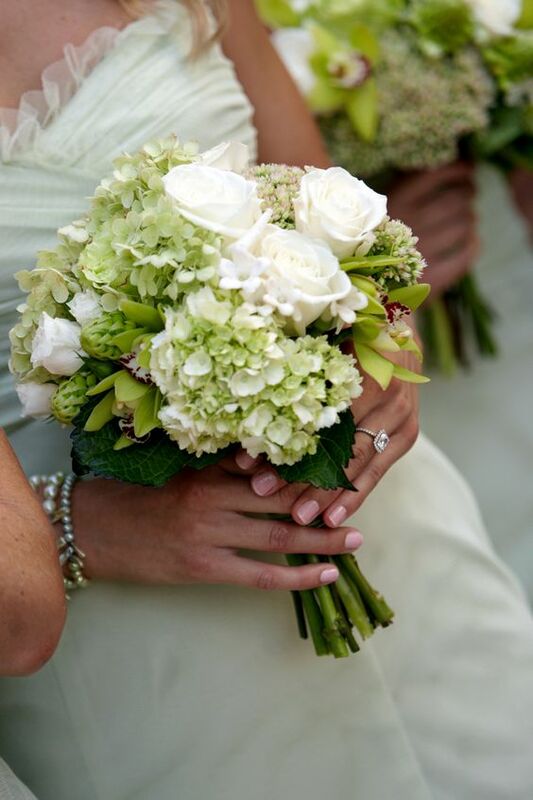 If you want an essential green wedding bouquet combination, just pick some green hydrangea flowers and mix them up with a lot of greens and blooms to make a delightful arrangement for your wedding bouquet. These are great for a spring or summer wedding bouquet, garden wedding theme or if your favorite color is green! 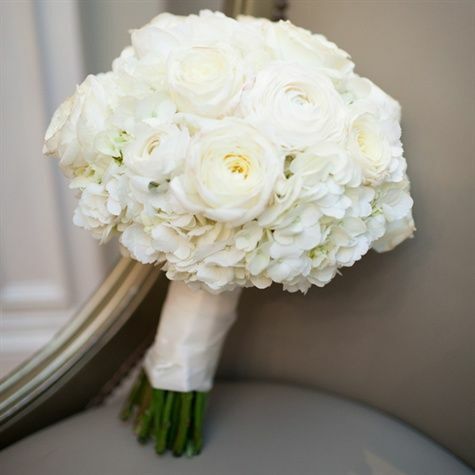 If you want something sophisticated and classic and yet want to make a statement for the wedding ceremony, add some green hydrangea flowers to a bridal bouquet containing white roses and ranunculus in the mix. For completing the arrangement, use a navy blue ribbon to spark some more elegance for the look. You can also make a statement with hydrangea for those of you looking for a more bold and vibrant look for the ceremony. The absolute bold element to these beautiful and full hydrangea that are perfect if that is the look you are going for. Because they come in so many different colors, your imagination can run wild with your bouquet for this theme. 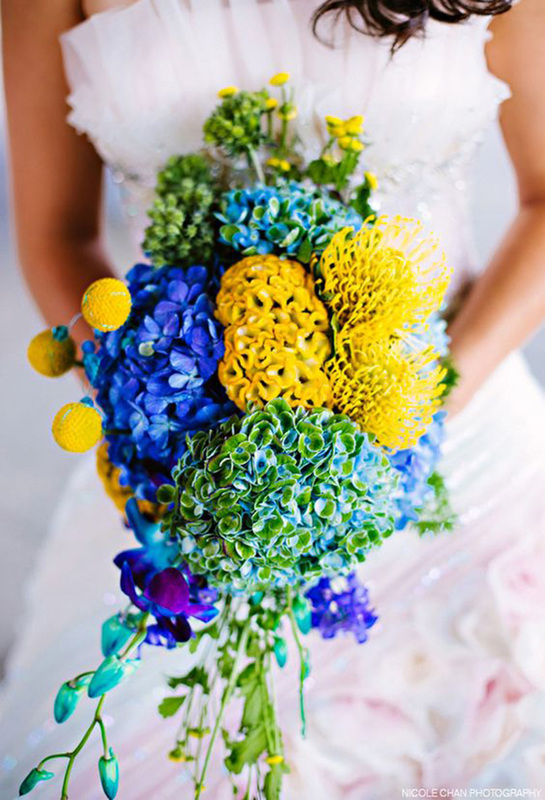 There are so many fun, yet beautiful wedding bouquets that you can come up with. Hydrangeas are perfect for all sorts of wedding flower arrangements and that too without the price tag that is often associated with more beautiful and glamorous wedding flowers. Although essentially a summer blossom, they are easily available throughout the year to make gorgeous wedding flower arrangements for couples and that too without stretching the budget criteria. If you’re thinking about using fresh-cut hydrangeas in your wedding bouquets, wedding décor and floral arrangements, just remember to hydrate them well. The blossoms need a lot of water to survive even in the normal weather conditions and could wilt easily in absence of the proper care. Rustic, modern, romantic, garden, chic, or traditional; hydrangeas work perfectly for all sorts of wedding themes and color palettes and that’s why we love them! Thanks Emily!! Great post for decrease budget for wedding. I love everything about this. I love your passion for the good! Thanks for letting us be a part!